Site security - should I worry? Can you check again - we had an issue earlier this morning and it was resolved around 7am. I'm still getting a warning about sending secure data over an unsecure connection. Yesterday I also wanted to update my card details (for payment of my BOB fees), and the connection was also not secure - no padlock and normal http, instead of https. Please check this again, it should be resolved. No one has answered my question: SHOULD I WORRY ??? I am not comfortable logging on when I don't know how risky it is. Is this still happening this morning (i.e. the login URL: https://www.bidorbuy.co.za/jsp/login/UserLogin.jsp)? Can you do a ping bidorbuy - Bid, Buy or Sell cameras, computers, diamonds, coins, cars & more on auction at cheap prices or tracert bidorbuy - Bid, Buy or Sell cameras, computers, diamonds, coins, cars & more on auction at cheap prices on your PC (via the command line)? We did have a glitch early Friday morning, but the above login page should show the secure padlock and the green address-bar. I subsequently received a Bob email and it does the same thing. 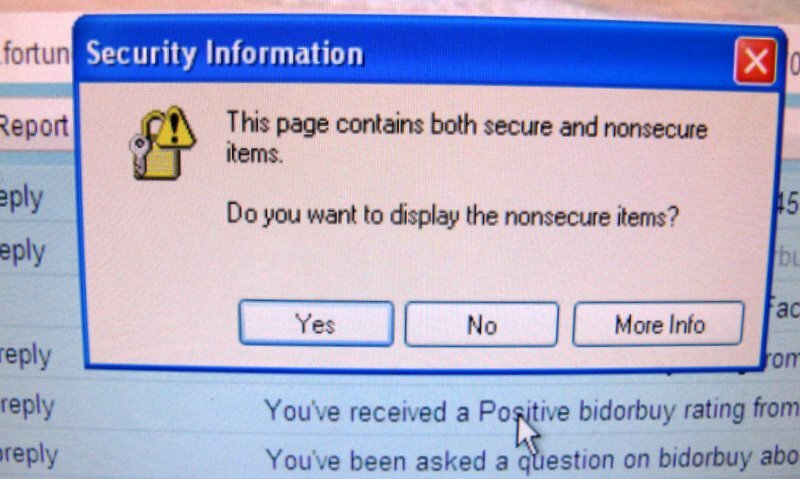 "Do you want to open the secure and insecure"
What is on Bob that is insecure? One of our engineers will give you a call today to find out what's going on. It's the first time we have heard of such issue. I subsequently received an email from Ebay and this secure and insecure thingy came up as well. Those are unrelated. The issue on the 7/2 was due to taking new servers online in the morning and we were still busy configuring the SSL certificates as some users got routed to the new servers. Your issue is different. It would help if you can forward those mails in question to customer support and we will then have a look at it. The secure/insecure message would only come up in a case where secure (HTTPS) and unsecure (HTTP) content is mixed on a webpage or email. Bidorbuy does not send out emails with HTTPS content. You will find that plain text mails would not give you these warnings. So you need not worry about these errors as mail is not supposed to be secure. When you should worry is when you are login in to a site or providing sensitive detail like credit card details and you see these errors. I will look at the mails shortly, but believe this is the problem. I gave you my email and you are welcome to call me at any time during office hours to help you get to the bottom of this.